My Nubian goats are spoiled. Dairy goats in general seem that way, or so I hear. They hate to get wet or tromp through the snow. They like to go out romping. Snow days are tough on them. The first day wasn’t too bad. My herd is smaller now and has plenty of room in the barn to argue among themselves. Standing around with enough hay in the troughs to replace their bedding is fun too. Snow is still covering most of the ground. 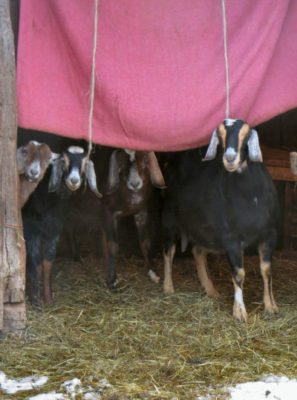 Still my Nubians look out from under their door cover blanket hoping I will open the pasture gate. Somehow I must be able to give them their pasture back minus the snow. I wish I knew how. They need the exercise. Mobbing the milk room door is not exercise for them, only frustration for me. Even Augustus didn’t mind the first day. He is lonely now without Gaius around. He liked having the herd stay around all day. Day two wasn’t so fun. The goats have plenty of hay to eat. They are bored with hay. Acorns are tastier. New hay doesn’t appear often enough. Water is another complaint. The buckets don’t arrive often enough. Of course, the goats can’t be bothered to get drinks when they do arrive. New hay is on the agenda, then water. I am supposed to wait around until they are ready. Nubian buck High Reaches Silk’s Augustus has room in his pen, just not enough. By day 3, he is ready and eager to get outside and run. Unfortunately the snow is not leaving and he is stuck watching the world go by. Exercise is important. The goats chase each other around in the barn. There is one bench and the thunder of feet going over it is almost continuous. I’m glad I got it repaired last week. Augustus is tired of snow days. His pen is big enough for a short time. Two days is too long. He wants out to play too. His brand of playing is not appreciated by the does. Up north the snow days lasted for months. This herd would go nuts. Luckily for my herd Ozark snow days last only a few days. The storm should pass tonight. The sun will start melting the snow tomorrow. By the next day the goats will be ready to race out the gate churning up the mud as they buck and bounce their way out to find those acorns. Enjoy raising goats? Try Dora’s Story. 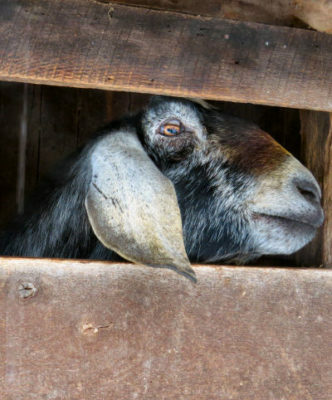 This entry was posted in High Reaches and tagged keeping goats in due to weather, Nubian dairy goats, Ozarks on January 16, 2019 by [email protected].